My Quick Guide Through Breast Cancer helps to ground newly diagnosed women with breast cancer in the reality of their treatment and recovery process. It focuses on providing them with tips, pitfalls and practical information to get them through this challenging year. Getting breast cancer marks a huge shift and diagnosis often comes at the most inconvenient time. It can temporarily put fear and disorganization on the forefront of your life, emotions and thinking. So, the first step is to take a deep breath and to center yourself. This book can help. 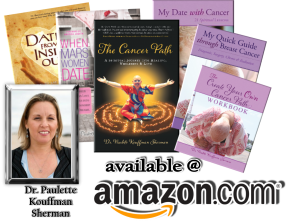 Dr. Paulette Kouffman Sherman, a psychologist and breast cancer survivor herself, wrote a four-book Cancer Path series to help you absorb your diagnosis, assess your treatment situation and get you through your surgery, chemotherapy and radiation in the best possible way. She shares her personal experience in the hope that you will feel less alone. She wanted to create a quick guide that would fit into your purse so you could carry it with you during hospital appointments. Reach out to relevant cancer organizations. Figure out your “Healing Team” and contact numbers. Make a Mind/Body/Spirit healing plan. Understand your blood counts, chemotherapy cocktail and doctor notes. 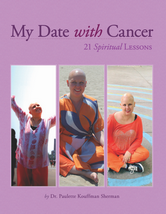 Explore getting a wig, a short haircut, hair loss and henna crowns. Create a work plan that’s manageable during your treatment. 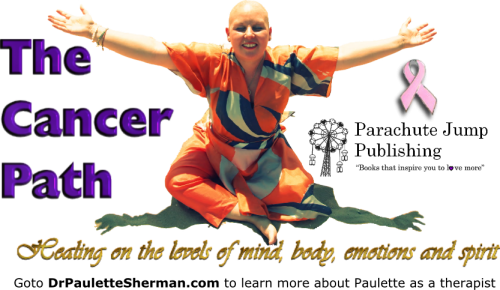 Make a list of chemo buddies. Find a few good cancer role models and sounding boards. Explain the importance of the BRCHA test & the Neulasta shot. Explore the role of your diet with a cancer diagnosis.